Long before he sold 120 million albums globally in a career that has endured artistically and commercially like no other performer's in the rock era, Bruce Springsteen was a working-class New Jersey kid with a dream and a guitar. By the time he was 16, he was playing ShopRite openings and school dances around his hometown of Freehold. For many, high school is where the garage-band dreams die, but time spent fronting a band called Steel Mill in the heyday of Asbury Park's Upstage scene gave him the courage to sidestep college and put his name out in front, soon enough making him "The Boss" to his band. After five more years spent working diligently on that dream, Springsteen had landed the dueling Time and Newsweek covers that made him an instant household name on the strength of his album Born to Run. 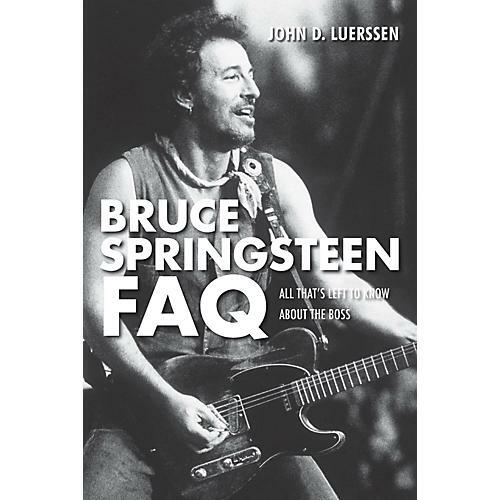 Bruce Springsteen FAQ: All That's Left to Know About the Boss investigates Springsteen's superstar Born in the U.S.A. album and tour, the dissolution and reunion of the E Street Band, the legal wrangling that held up 1978's Darkness on the Edge of Town, the group's postmillennium resurgence, the untimely passing of core band members Danny Federici and Clarence Clemons, and more. This indispensible read, packed with countless images of rare memorabilia, is a volume Springsteen fans will treasure.